Here is a re-post from a new blog I am helping out with, Sunday Night Cooking. Here is favorite of ours, that I stole from my partner teacher. I love it because you can adjust it so many ways, and it is super-quick--30 minutes or less! So it is great for those busy nights, or just when you aren't in the mood for cooking. You can use boneless skinless chicken, or any brand of chicken sausage, but this is my favorite brand shown to the right (I use Sweet Italian variety more than this spicy one). 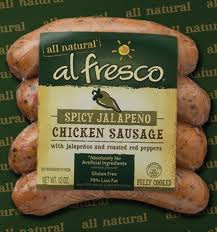 I think some of you may get chicken sausage from Costco as well? Good news on this recipe: You will only have to dirty one pot and one spatula! Heat EVOO on medium heat. Saute garlic for 1 minute, and then toss with diced onions until they are translucent. Gradually add veggies to saute as well, adding first veggies depending on how long they will need to cook. I have even used frozen veggies, if I am really low on time. But I usually allow about 10 minutes to fully saute the veggies. I add the meat after I saute the veggies, but if your meat is not pre-cooked, make sure you do that in a second pan, and then add it a little later. If it is pre-cooked, it will just take a few minutes to warm up in the pan with veggies. If you want more of a sauce, add some chicken stock and a little cornstarch. This is also the time that I add some kind of dressing/marinade to the pan, and my favorite is the vinaigrette I listed above. I'm sure many of you have that recipe, but I can add it later if not. I usually add the basil and/or olives now, and if your family loves cheese, a little of that won't hurt either. Yield: 3-4 servings. Enjoy your 30-minute one-pan wonder!